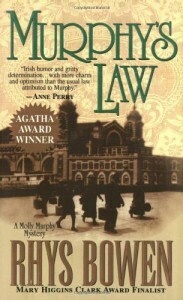 When spirited redhead Molly Murphy commits a murder in self defense she must flee from her family's home in Ireland. Molly meets Kathleen O'Connor and her two children Seamus and Birdie who are getting ready to set sail to America. When Kathleen asks Molly to take the kids on the ship to America and deliver them to their father, since she was diagnosed with tuberculosis she won't be allowed on the ship or into America. The four of them make their way to the dock where the ship is Kathleen tells the kids that she forgot her ticker at home but that Molly will take them to their father since she doesn't want them to know she is sick. When the ship sails into New York Harbor, with the majestic Statue of Liberty providing comfort and inspiration, Molly's sure that her whole life is in front of her. But there's one last hurdle to clear: Ellis Island. She's just one of thousands of immigrants, awaiting their fate with anxiety and hope. Unfortunately, before Molly, Seamus, and Birdie are able to leave the island, a man is brutally murdered in the men's dorm. Coincidence's and fate make Molly a suspect in a crime that she didn't commit. Under a cloud of suspicion, and growing mutual attraction between Molly and the handsome police captain Daniel Sullivan who's in charge of the case. She's allowed to leave Ellis Island for Manhattan where she reunites the children with their father. Unfortunately, she's on a mission that she couldn't have anticipated and that's to clear her own name of murder. Alone in a new country with no one to lean on, Molly hits the vibrant streets of New York intent on finding out what really happened. The mystery has plenty of suspects and twists and turns which get wrapped up in a surprising way. Molly is a smart engaging character who uses her brain to figure things out, instead of being a damsel in distress type. I like that when Molly finds an apartment with more space than she needs she wants to give Seamus, Birdie, and their father also named Seamus one of the rooms so they don't have to live in a crowded apartment in a dangerous part of town. The way that Molly and Daniel interact with each other throughout the book you can see the beginning of a relationship starting to bloom.